Globalization is perhaps the new form of colonization, with mass media taking the place of Imperialism to erase cultures and absorb them into a homogenized ‘global culture’. What is usually meant by ‘global’ is ‘Western’ or ‘European’, with cultural deviations from such becoming an ‘alternate’, or a ‘curiosity’ for which there is no space within the mainstream, and which is then pushed to the periphery. In such a world, it becomes paramount for nations that have already survived Imperialism to assert their own cultural identity through a practice of decoloniality, reaffirming their individual presence and re-inserting it into the center without being absorbed by it. The project attempts to answer these questions through multiple investigations, and the exhibition itself acts as a supplement, or rather a starting point that offers up examples that can facilitate deeper discourse. This is perhaps why Karrar has chosen to include pre-existing works for the display. 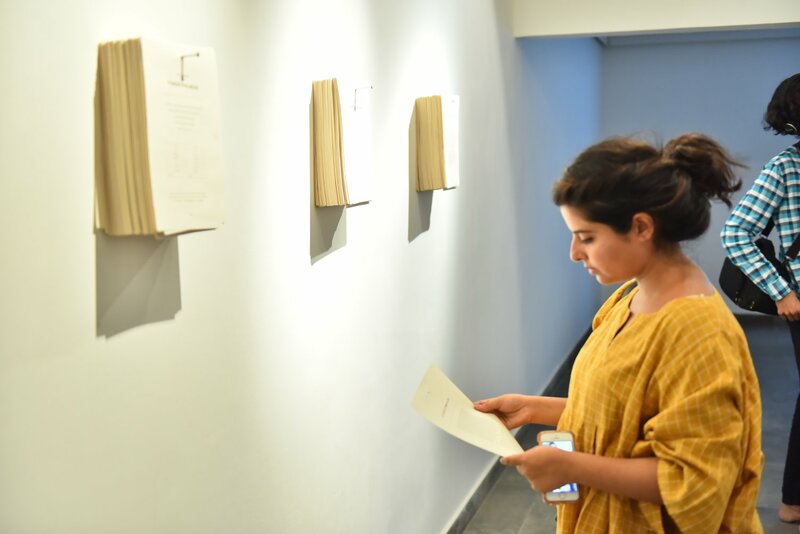 Through a focus on collaborative practices, which, she asserts, are gaining popularity as a representational format in Pakistani art, the project adds another layer of investigation into the ethics, politics, aesthetic negotiations, limitations and allowances of such practices in the current political and social context of the country, and how this lends itself to the creation of knowledge. All of this feeds into the discourse program and online aftermath, which has been taking place throughout the duration of the show. Individual themes explored within each work further allow for a better understanding of the questions being raised. These questions are perhaps most directly addressed in the first three works the audience comes in contact with, specifically in Abeera Kamran and Sumaya Kassim’s work, which poses the question of knowledge consumption and creation more directly in the decolonial context, applied specifically to museums in the West. The work brings up the colonial baggage carried by artists from this part of the world, and the presumptions and expectations that can serve to dehumanize them and create a sense of othering. 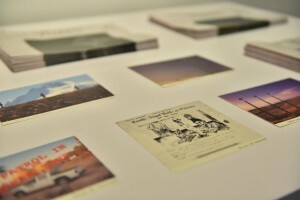 Phrases such as “Tell us about your trauma” in one of the works turn the seemingly sympathetic and receptive tone into an exploitative one with an asterisk that adds “Pain is a currency.” Another piece looks at the idea of cataloguing or archiving as a process of forgetfulness that allows colonial history to be rewritten through an Imperial lens of selective truths. Nida Kirmani and Dostain Baloch’s documentary film, also explores the manipulation of truth, but in a rather different context. The video explores the violence perpetuated by news sources and mass media, specifically a local newspaper in Lyari, Janbaaz, which almost comes off as a mafia, using fake news to control public sentiments and influence events. The public dependency on the news source, due to the lack of an alternative, allows them to exploit their influence even further. Fatima and Zahra Hussain also take a look at news consumption and its ability to shape the human psyche, but in terms of borders, politics and history. Historical news sources are presented side by side with official documents plastered with the word “FICTIONAL” in bold red, casting doubt on the credibility of the former, and blurring the line between fiction and reality. Both these works open up pertinent questions about the ways in which knowledge, both false and true, shapes perceptions of reality. If enough people believe a lie, giving it enough credence to steer the course of real life events, does it not eventually achieve the status of truth? This questioning of borders is further explored in the work of Shahana Rajani and Zahra Malkani. Their video focuses on deteriorating remnants of the Pakistan Railway tracks, excavating its history of violence. These artifacts are symbols of a fallen empire built on dreams of progress, dreams which are now destroying our present landscape. These borders become more metaphysical in Fazal Rizvi and Dostain Baloch’s work, however. 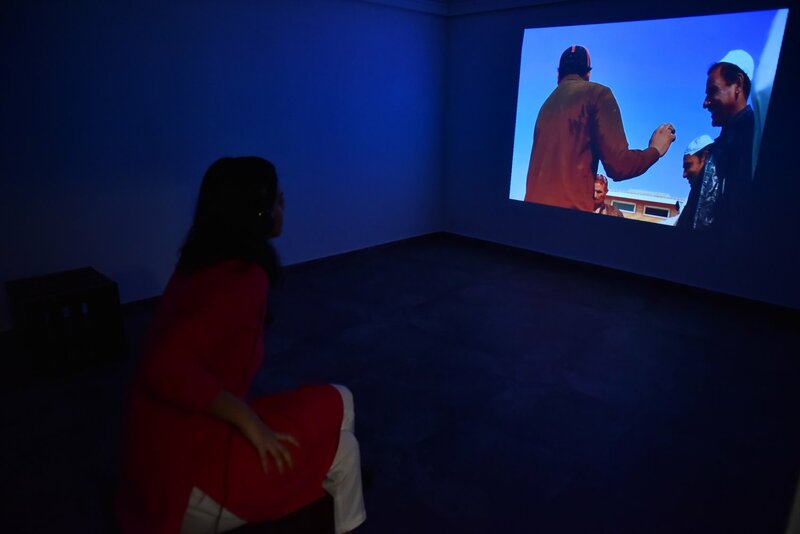 The duo explores the socio-political disconnect between different areas of Karachi, and the systematic exclusion and marginalization of Lyari, viewed as a space of tensions and violence. This leads to the erection of invisible borders, existing within our minds. This is highlighted by a familiar conversation between two individuals, seeming to belong to different countries, but in actuality, inhabitants of the same city. All of this is superimposed with a projected image of serenity, what seems to be the Lyari River, to offset the presumptions latent in the text. These works allow us to question the ways in which knowledge is influenced by borders in both historical and current political contexts. Such ideas of invisible borders also exist in considerations of public space in the performances of the Tea Collaborative, but in terms of its implications on accessibility rather than individual perceptions. A photographic documentation of one of the performances is included here, carried out outside the new Islamabad International Airport after access to the building itself was denied due to security concerns. The impromptu tea party by three women clad in white with props such as a helmet, recognizes the politicized and gendered nature of public spaces in Pakistan, while reclaiming these spaces beyond mere necessity through the enactment of a leisurely activity. 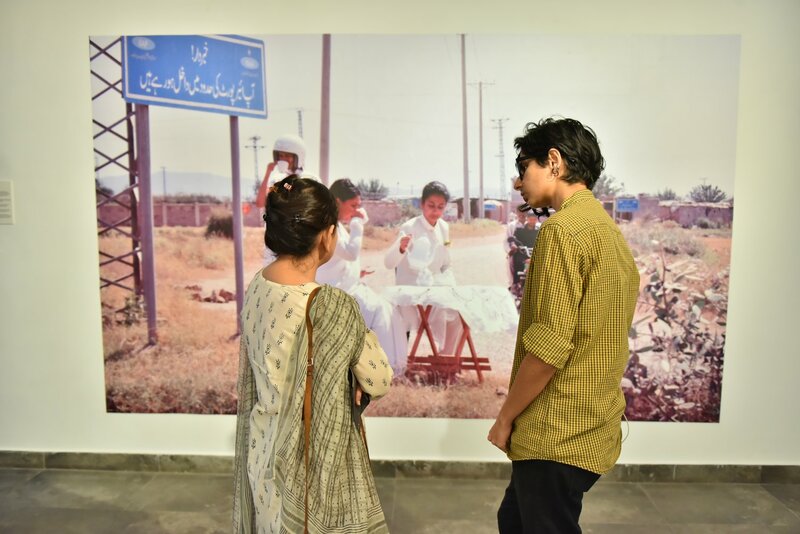 The Tentative Collective applies similar concepts to a particular migrant ethnic group in Karachi, the Pakhtuns, to explore the ownership of public spaces. The video, a documentation of the re-enactment of Pakhtun folk music on a roundabout, unpacks the power dynamics and restricted freedoms in the public spaces of Karachi in an increasingly policed and politicized climate. Each of the works included in the exhibit starts their investigations with questions of their own, much like the title of the show itself. Yet, as entry ways into the larger discourse addressed by the project, it would perhaps be presumptuous to expect any concrete answers from them. They rather raise further questions and become ongoing investigations into various aspects of our current realities, acting in conjunction with the discursive program to allow a more profound understanding of the role of knowledge and its representation in contemporary art forms.